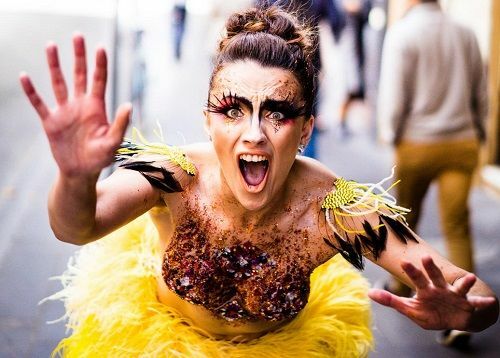 You think you know the story of The Ugly Duckling but you haven’t seen anything quite as FABULOUS, charming and energetic as Karla Hillam’s Melbourne Fringe Festival solo debut of The Ugly Duckling at The Butterfly Club. Like so many contemporary and millennial-driven upgrades to classic tales (remember the Selena Gomez or Hilary Duff Cinderella spins? ), The Ugly Duckling upgrades this underdog story with pop songs, witty humour and celebrity impersonating cameos. Duckie, played by Hillam, is a naive and twitty duck eager to spread her wings and earn fame and glory. Sadly she strives to follow the likes of recent social media queen, Kim Kardashian. But we see the bumps and bruises Duckie endures as she encounters opportunities with big heart and unwarranted judgement. Hillam knocks out a cracking (eh... ‘quacking’) performance. Throughout The Ugly Duckling, Hillam brilliantly showcases her multi-faceted talent as she waddles across the stage to undergo numerous costume changes, slipping in out of multiple character impersonations, belting out stellar melodies to challenging pop hits and dancing all the right (and silly) moves directed by choreographer Brett Fisher. Hillam proves she has fierce stage presence. Crowd-pleasing songs from today’s pop performers like Taylor Swift weave in and out of throughout the story. Most memorable is the duet between Hillam and musical director and accompanist, Andrew Kroenert as they sing Taylor Swift’s ‘You Belong With Me’. The resonating harmonies and buzzing chemistry between Kroenert and Hillam’s characters earn an uproarious applause after the number. The Ugly Duckling also pays tribute to some iconic songstresses from years past and present. Making impersonating cameo appearances are celebrities like Jessie J, Whitney Houston and Dolly Parton who offer absurd and often cruel comments. The audience could define these comments as a means of bullying but Hillam’s facial reactions and immediate responses make light of the situation. Good on ya, Duckie! Overall, the show is entertaining, light-hearted and witty. If this performance serves Hillam as a tool to introduce her work ethic and talent to the Melbourne performance community, she has certainly left her mark.